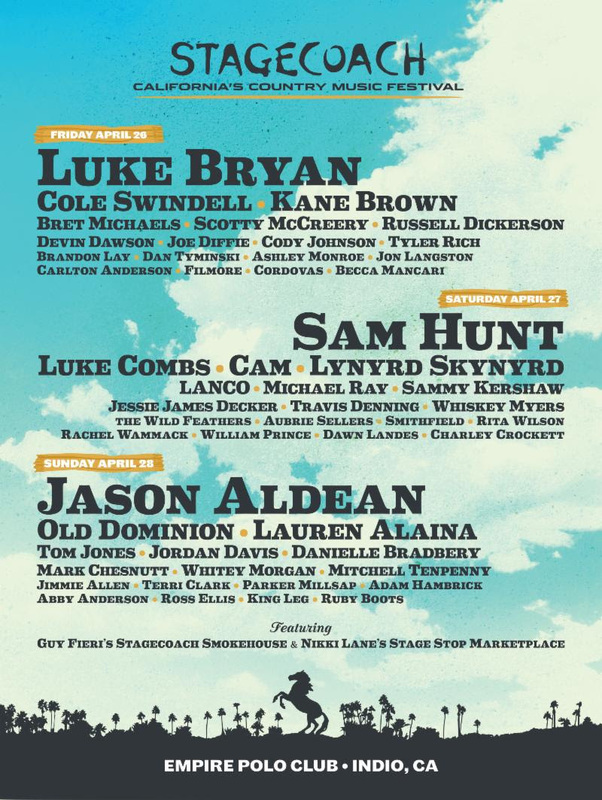 The lineup has been revealed for 2019’s Stagecoach festival, which returns Friday, April 26-Sunday, April 28. Luke Bryan will headline Friday, while Sam Hunt will lead the Saturday lineup and Jason Aldean will close out the festival on Sunday. The festival returns for its 13th year at Empire Polo Fields in Indio, California. The three-day event will also feature performances by Cole Swindell, Luke Combs, Old Dominion, Kane Brown, CAM, Lauren Alaina, Lynyrd Skynyrd, Bret Michaels, Tom Jones and more. Guy [Fieri]’s Stagecoach Smokehouse is back this year with a new cast of the nation’s finest pit bosses alongside the most celebrated restaurants and BBQ vendors. Guy and friends will be showcasing their pits and rigs and offering taste tests to fans throughout the weekend with live demos. Stay tuned for the full food lineup. Returning to the festival this year is the SiriusXM Spotlight Stage, which will once again highlight today’s rising stars like Tyler Rich, Travis Denning, Mitchell Tenpenny and more. The Honkytonk Dance Hall also makes its return alongside the latest fan-favorite, Nikki Lane’s Stage Stop Marketplace. Car camping returns for 2019 with the added option to purchase Companion Camping Parking for additional vehicles. Revisit The Resort this season with full amenities like the internet café, charging stations, General Store, Supermarket Shuttles and on-site pedal cabs. These options and more will be available for purchase, with Travel Packages, Shuttles and the all new Safari Camping Experience available via Valley Music Travel. Festival passes go on sale Friday, Oct. 19 at 11 a.m. PDT at stagecoachfestival.com.